"We don't restrain ourselves in playing certain phrases for the sake of losing a certain tag". Original Taste and their genius guitar player Rory Gallagher (R.I.P.). I must admit that prior to watching this DVD I never really thought of Rory as the proper guitar hero. Yeah. I know. However, this is ancient rock stuff and way before my time. No excuse and merely the note as to say, you can't keep track of all the rockers in the past no matter how hard you try. 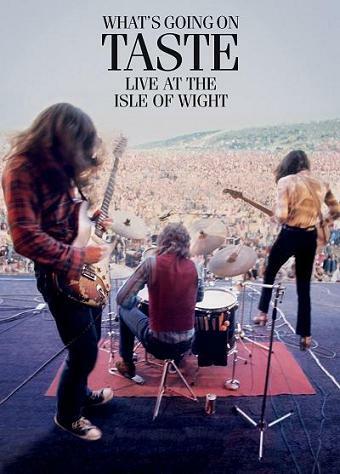 Their 1970 gig at Isle of Wight in front of the largest festival audience yet held (up to 600,000 people), reek of blues and compositions that have a lot in common with Jimi Hendrix and The Cream (Eric Clapton). Rory was the Northern Ireland version of both mentioned geezers and there's plenty of improvising with the blues scale, on the quarter tones, on the feedback, and on the vibrato. There's also some kind of avant-garde jazz in the mix and Rory even played the alt-sax on a couple of tracks. The old roadhouse blues of Gambling Sound and Catfish ditto, blend nicely in with Rory's own Morning Sun or What's Going On. John Lennon championed Taste while Hendrix when asked how it felt to be the world's greatest guitarist, replied that he had no idea and the question should be redirected to Rory. There's no bitter after Taste, simply just a great live performance and surprisingly good sound and vision for such a old concert. The bonus material is the black/white gig at Beat Club (1970) and P3 Music promo Videos where especially "I'll Remember" goes to history with its trigger happy old time geezer. Murray Lerner, director of the documentary spoke to several musicians and there's a mix of old and new interviews. Bob 'Boomtown Rat' Geldof talks about the 1970 gig when he saw Taste up against everybody, The Doors, The Who, Jimi Hendrix, Leonard Cohen. "I will put them, at that festival (this very DVD) top three acts easily". The Edge (U2), thought that Taste had basically done the impossible. Come out of Ireland and gone all the way, played on the same stage as Hendrix, and taken most of the world by storm. Brian May (Queen) talks about Rory as a magician. "He's one of the very few people of that time who could make his guitar do anything it seemed, it just seemed to be magic. Rory gave me my sound and that's the sound I still have", end quote. It's all there. Approx 163 mins. Full live tracks, background history and musical beginnings. A must have if you're into Gallagher or artists such as Clapton/Cream and Hendrix. Highly Recommended.